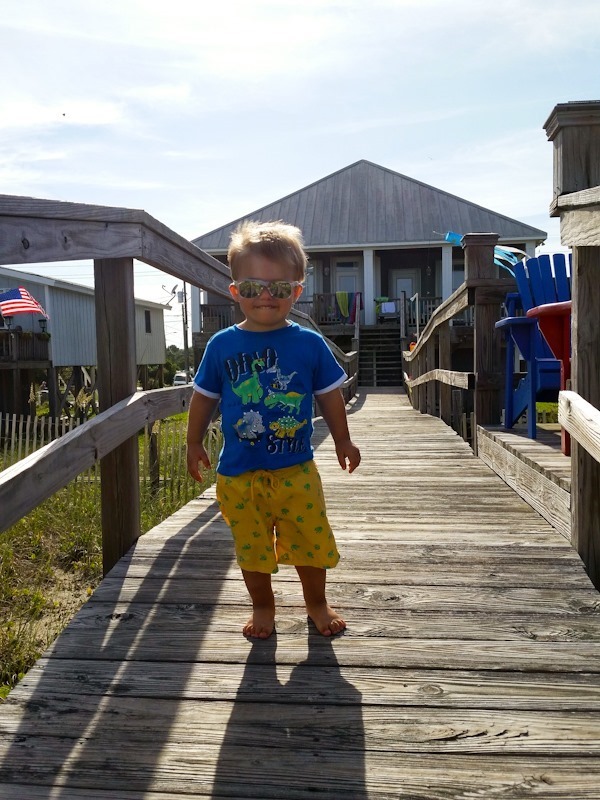 We had an absolute blast taking Mazen to the beach this year. Our first visit to the beach was when he was just learning to crawl. That wasn’t very fun. During our second visit he was just learning to walk. We had a little more fun, but he still didn’t really know how to play on the beach. This year he was 22 months and had a wonderful time! The first day he was quite scared of the ocean. He was content playing in the sand. But by day 2 he started to explore the surf and by the end of our week he was begging us to take him deeper into the water. "MO WAVES!" 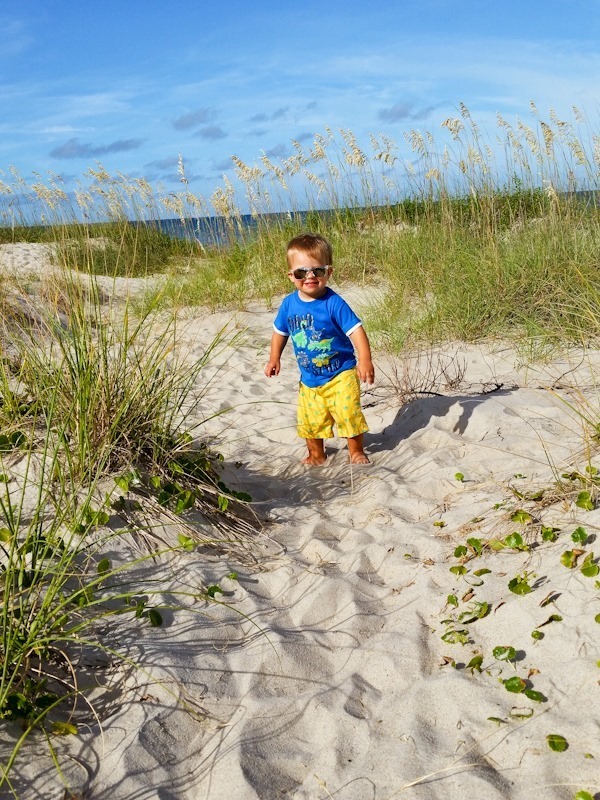 Here are five tips for taking a toddler to the beach! 1. Bring a baby pool. This was Caitlin’s genius move. She packed a blow-up baby pool that we were able to fill with water. When the toddlers were first timid about the water or when the grown-ups grew exhausted from jumping in the waves, the pool was a lifesaver to keep them happy. 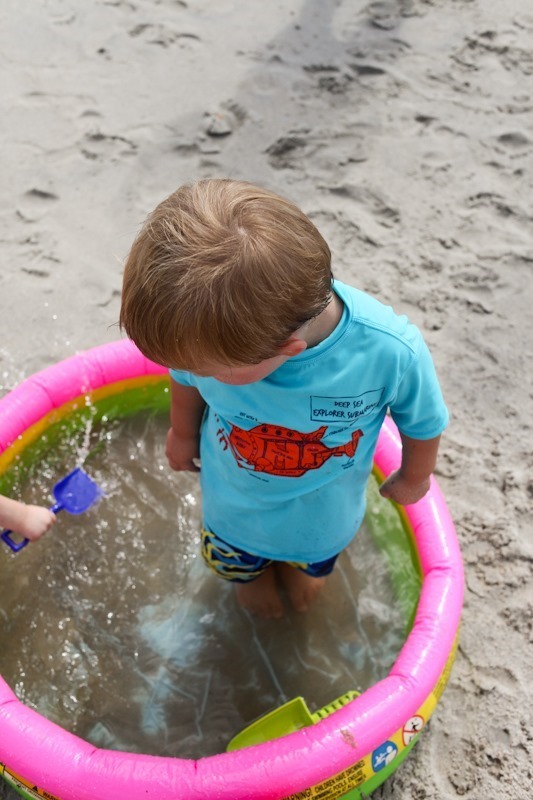 They alternated games of "swimming", throwing sand inside, dunking toys and cleaning hands. 2. Purchase a few new sand toys. I bought the boys matching sand dump trucks that were a big hit! Matching because then there would be no bickering and sand trucks because the wheels were big and there were no creases for sand to collect. Moreover, they were designed to be completely rinsed off when the day was over. They had lots of fun scooping sand into the back. 3. This beach bag. I can’t say enough good things about it!! The outside pockets are amazzzzing for sunscreen, diapers, snacks, etc, and the mesh material was awesome for sand, sticky, etc. It can all be rinsed off! I’ve never had a beach bag that I even liked, so to find one that I love makes me really happy. 4. Shade. Thanks to Caitlin for their great tailgate tent. We were planning to buy one this year but put it off since they already had one. I can’t go to the beach in the summer without shade, and it was so nice to have a full-size tent rather than just an umbrella. I know little pop-up tents are popular for babies, but I hated the one I bought second hand last year – I couldn’t fit inside and it was hot! A big open air tent like this is way more practical for a day at the beach. And necessary if it’s a scorcher and you plan on staying out a while. 5. Baby sunglasses, a hat, a rash guard or just lots of sun screen. Whatever your toddler will tolerate! My child wears sunglasses like it’s his job, but he refuses a hat. Caitlin’s son doesn’t mind a hat, but tears sunglasses off. I’ve heard these sunglasses are great for babies (and the company will replace them if they break like our GAP ones did a few months in!) I love this company for rash guards and hats too. If you can cover up as much as you can with fabric, putting on sunscreen gets a little easier. 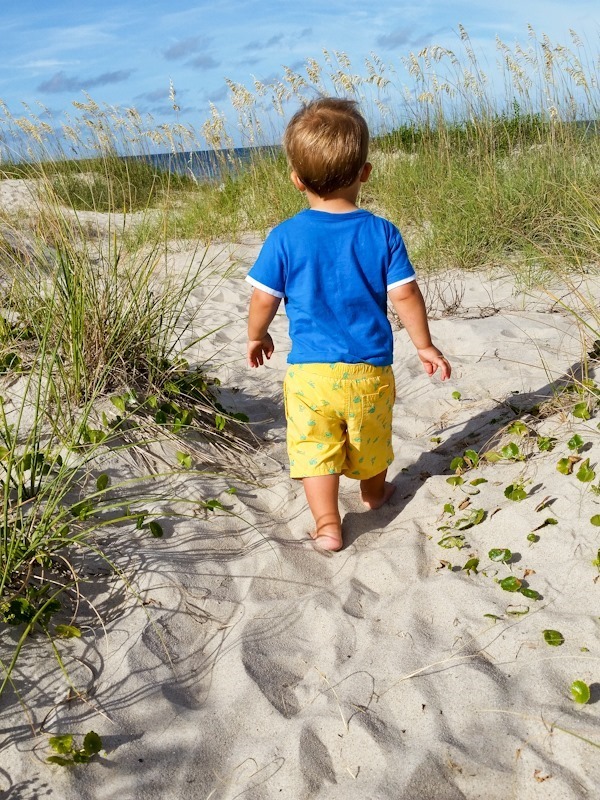 What are your best baby beach tips? 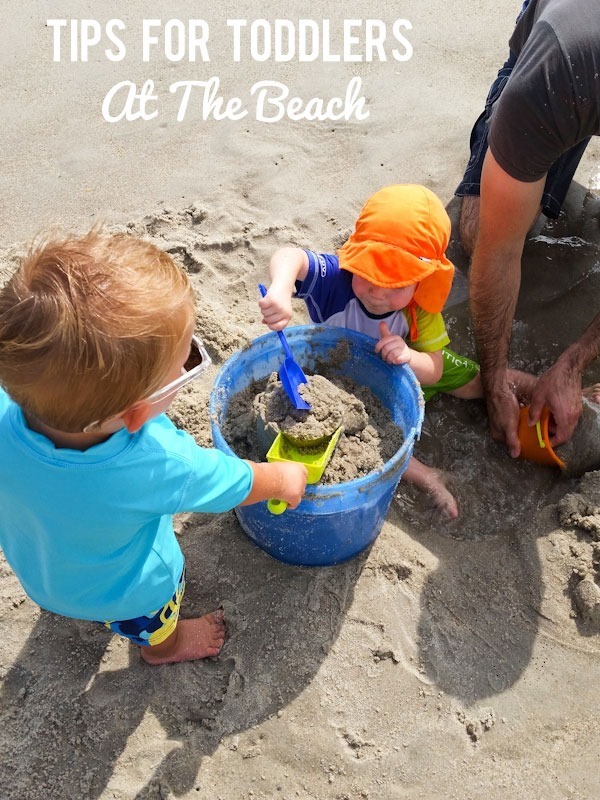 what do you do as far as diapering at the beach/pool? my daughter gets THE worst diaper rashes every time she is in one of those swim diapers. in fact the last one turned into such a bad yeast rash that I haven’t taken her swimming again since, and she loves the water so I feel bad! Aw that stinks. We just use the swim diapers. They make cloth ones…maybe you’d have better luck with those? 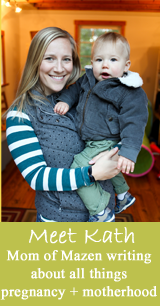 Our friend’s little guy has super sensitive skin and can’t wear regular (disposable) diapers of any sort. They use cloth for everything, including cloth swim diapers, and those work great. They’re cheaper than swim diapers in the long run, and super soft on the skin. I think most of the cloth diaper brands make swim diapers, and when we did cloth, we just went with regular cloth diaper (not a swim one in particular) without the inserts. Good luck!! Target makes a cloth swim diaper that’s pretty cheap and worked well for us last summer (can’t remember exactly, but like <$10). This summer we started just using the shell of one of our cloth pocket diapers (inserts removed) since we already had it! Buy/rent a wagon and leave the stroller at home! We rented one this year for our trip to FL had a canopy, plenty of space and even cupholders on top for our 6pm family “booze cruise” – which was just a stroll to the beach and around town at Rosemary Beach. 🙂 We don’t really have the space for something like this at our house, so renting it really was worth it – and I didn’t have to worry about it being all sandy since the rental company took care of washing it. If possible, choose accommodations that have a washer/dryer. Claire threw up 3 times (!!!) on the car trip down and again once while there (stomach virus, we think). Needless to say we were SO happy we had a washer and dryer since there were lots of towels, clothes and her entire car seat lining that had to be majorly laundered! I learned that with a little one you just never know when it’s going to go from a nice-to-have to a MUST-have appliance. Looks like y’all had a great trip!! I’m jealous – Claire wasn’t into the beach at all when we went back in May (20 mos). Hated the sand! I should’ve done the baby pool idea – so smart! Great tips! Love the booze cruise haha! We always bring a blow up baby pool too. I thought I was the only one who knew that fancy trick as I’ve never seen anyone else with one before! 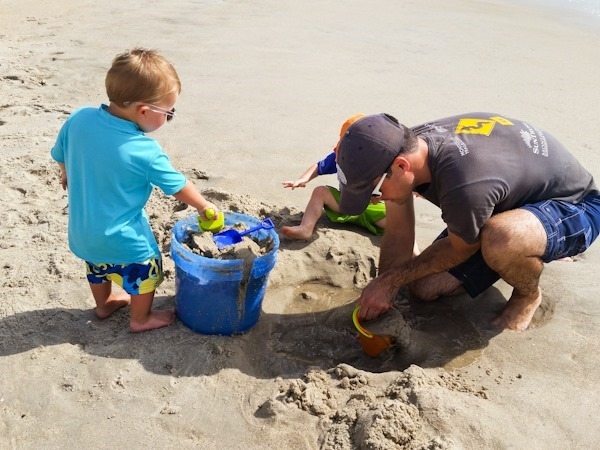 We bring a BIG one that fits 5-6 little ones and we make the older siblings take the 1,000 trips to the ocean to fill their pails to fill the pool. It takes them a solid 30 minutes! My favorite beach trick is the DUNK AND WRAP for naptime. Dunk them in the ocean – heads too – and then wrap in a towel before walking along the beach. My kids never take more than 10 minutes to fall asleep on the beach that way. Haha love the dunk and wrap! 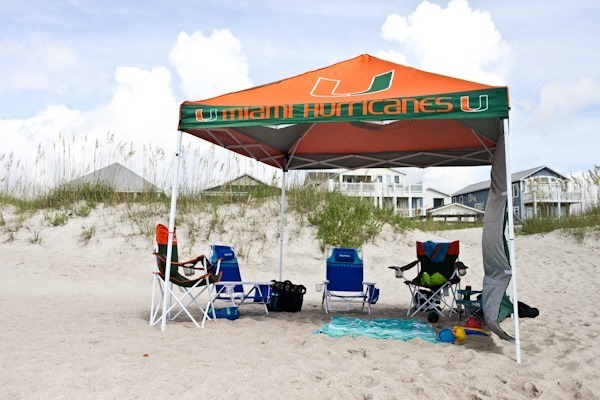 I’m heading to the beach this weekend with a canopy similar to the one you used. Did it catch thw wind at all and attempt to blow away, or was it anchored down by anything? Thanks for your input! 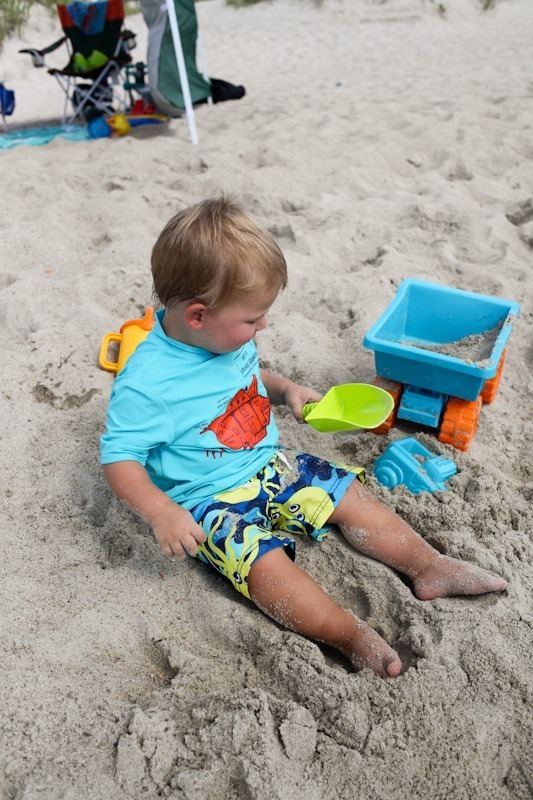 My husband’s family are Jersey Shore beach pros and taught me to bring baby powder for getting sand off little ones when you’re ready to head home. Works great! Nice ways to maximize fun! I think I spent hours on the beach as a kid, just having a blast trying to jump over/outrun the waves. 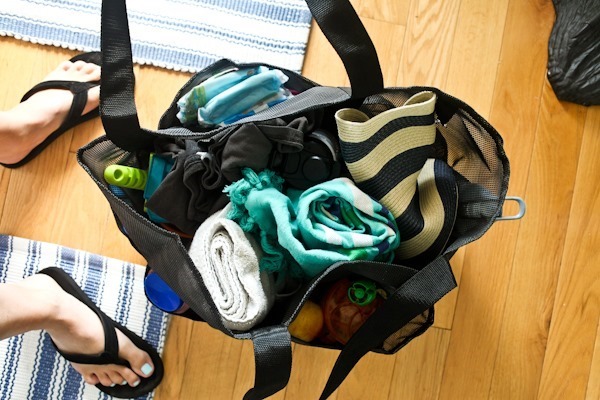 Haha, your feet in the beach bag photo. Does mazes run off at the beach? My daughter is 19 months and always runs off or goes through people’s bags! It’s so embarrassing! Haha not really. We keep a close eye on him. I’ve become an expert at bringing toddlers to the beach, seeing that I vacation in Sardinia every summer! Besides the obvious, the one thing I can’t do without is this waterproof, zip-up bag in which I can shove all the wet/sandy/dirty bathing suits! That way nothing gets wet in the beach bag and I can also just hang waterproof bag to dry! No fuss! Canopies are great, but not all beaches allow them. Check before you drag them out there! We live less than a mile from the beach so we go a lot. I’ve found it easiest to only go during the mornings when the beach is shaded by the condos. This way we don’t have to bring an umbrella or other shade. We also always travel light. Just two towels, sunscreen, water, snacks, and a couple of toys. It isn’t as much fun for me when I have too much to carry (especially since it is usually just me, and no help from hubby). Oh, and I had to get over the fear of having sand in my car. We take half the beach home with us, and I’m perfectly okay with a sandy car now. I know there has been a lot of hype about spray sunscreen lately, but we always have it just in case. I refuse to rub lotion on a sandy baby. So we do lotion before leaving the house, and spray for re-application. I never had a problem with Robert learning to crawl on the sand. He loved it while crawling. I never had to make those cheesy sensory bins or boxes because he got tons of different senses from the beach. You’d never know we are beach bums from our pale skin! We only stay for 30-45 minutes because it is just way too hot here in South Florida to stay longer! Great tips, glad you had fun! 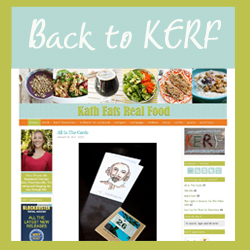 What a great swag of info,much easier to have helpful advice than to do things the hard way. I noticed Mazen’s green digger…..WAAAAYYY better than a shovel even when they are older, great find. Baby powder takes sand off instantly. My scientist husband explained to me that the corn starch absorbs the moisture, so sand just brushes off. Best tip ever given to me. You can sprinkle it on your feet to slip on shoes, sprinkle on a bottom to wipe off sand, etc…..
Where did you get the sand dump truck or what brand is it? We are going to obx next week with our 16 month old and I think she would love one! Thanks for sharing that information. You have shared some good way to save toodlers and keep em safe.